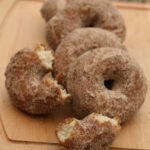 Apple Cider Doughnuts are a cake style doughnut rolled in a cinnamon sugar mixture. They are simple to make and will remind you of fairs and apple orchards. Do you remember fair food? 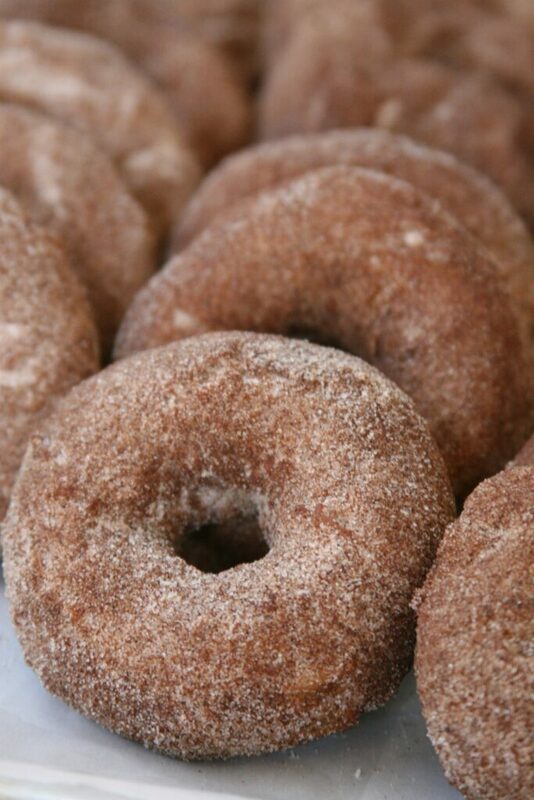 Or delicious homemade Apple Cider Doughnuts from a local apple orchard? These homemade doughnuts rolled in cinnamon sugar will remind you of days spent at an old-fashioned fair or the local apple orchard. The wonderful addition of small pieces of apples will make your mouth water. How to make homemade apple cider doughnuts? This delicious, cake style doughnut is made with boiled down apple cider, buttermilk, butter, flour, and sugar. Let the apple cider cool completely before adding it to the mixing bowl. While they are still warm, roll in cinnamon sugar mixture or dip in a thin glaze. You’ll need a rolling pin and a doughnut cutter. Order a doughnut cutter on Amazon. Unless you have a small, independently owned kitchen store, a doughnut cutter is a bit hard to find. Make these doughnuts the night before, place them on half sheet pans lined with parchment paper and loosely cover with plastic wrap. Place the sheet pans in the fridge until the next morning and you can fry them up fresh. This helps keep your work to a minimum. And, there’s nothing like a freshly fried doughnut with a cup of coffee! Don’t forget to order a few of these doughnut cutters. They are the perfect size. I like to have a few, so I always have a clean one ready to go! This autumn or winter try making these yummy apple cider doughnuts. They are finger licking good rolled in cinnamon sugar. In a medium saucepan over low heat, reduce the apple cider to about 3⁄4 cup, about 20 minutes. Set aside and cool to room temperature. Sift together the flour, baking powder, baking soda, salt, and spices into a medium bowl and set aside. In a large bowl, use a hand mixer to cream together the butter granulated sugar, and brown sugar. Add the eggs one at a time and continue to mix until incorporated. Use a rubber spatula to occasionally scrape the sides and bottom of the bowl. Add the reserved reduced apple cider, buttermilk, and vanilla extract, mixing to combine. Add the flour mixture and combine. Gently fold the chopped apples into the batter. Turn the dough out onto a lightly floured surface, and use a rolling pin to roll out the dough to 1⁄ 2 inch thickness. 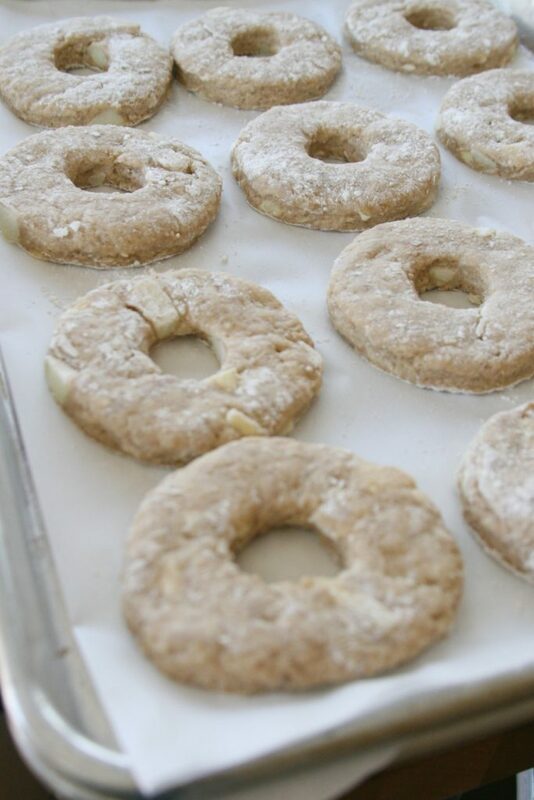 Lightly flour a doughnut cutter and use it to cut out the doughnuts, then place them onto the prepared baking sheet. Line a baking sheet with several layers of paper towels and set aside. In a large heavy-duty pot, add about 3-inches of canola oil. Heat to a temperature of 375 degrees F. Drop about 4 doughnuts into the oil, making sure not to overcrowd the pot. Cook for 1 to 2 minutes on each side, or until lightly golden brown. Remove the doughnuts from the oil and allow to drain on the paper towels. In a small bowl, combine all of the ingredients for the cinnamon sugar; mix well. While the doughnuts are still warm, sprinkle them with the cinnamon sugar. I most definitely want to be able to reach through the screen and try one of these right now. I bet they are at there most delicious when they are still warm yum! These sound so delicious. Homemade always taste so good and these need to be made. 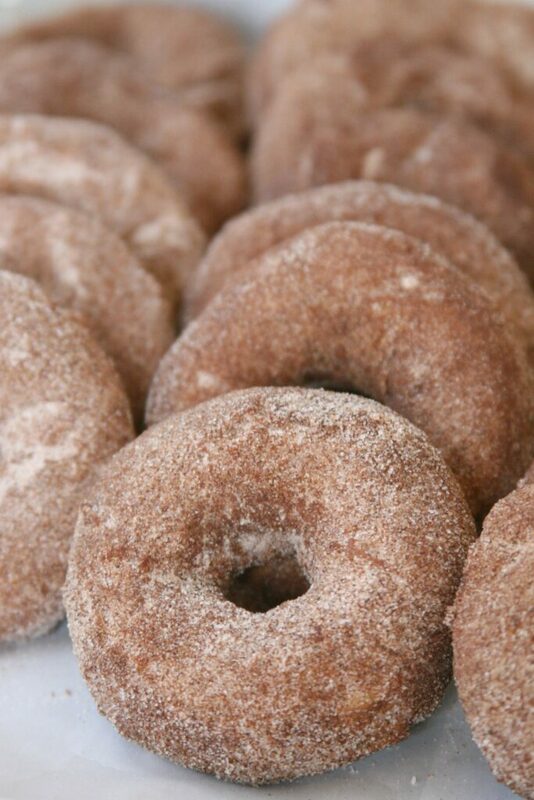 Omg, I love apple cider doughnuts! This post just made me really excited for the fall, I’ll have to try to make these then! It’s been SO hot lately, we’re all ready for fall. You’re gonna love these delicious doughnuts! i havent had donuts! the sound and look of this got me into craving mood. and plus i havent tried this flavor before! I have always wanted to try making doughnuts. These look SO good! I will definitely give them a try. Homemade doughnuts are easy to make! Thanks for stopping by! I loveeee apple cider donuts! They’re especially perfect in the fall. Yours look so yummy! Wow! It looks yummy and delicious. Now, this is very creative loved this apple cider doughnuts. Thank you for sharing this great recipe. Apple cider works so well in this recipe! Thanks Emma! I give this article and recipe 5 stars! This is one that we will have so much fun making at home. One of our favorites in my house, now you have shared with us how to make it. Thank you! They are simple to make and delicious. Thanks for visiting! We love apple cider too! They’re the perfect fall treat. This looks so good! I never though to try this kind of recipe out before but I’ll have to give it a try this weekend. Thanks for sharing! These look delicious! We’ll add it to our recipe list! It is raining hard today. And I think this will be perfectly paired to a cup of hot cocoa. Yummy! Oh yes! They would be delicious with a hot cup of cocoa! I’ve only made doughnuts once and they did not look as good as these do! I would love to make these for my family someday. Oh my goodness, I always buy these from my like orchard! They’re so good but I thought they’d be too hard to make. I might have to give this recipe a whirl. They are so easy to make. Everyone in your family will love them! I love donuts from the fair. I would definitely get way off track of my diet to be able to make them myself at home. Still can’t wait to try the recipe! I love fair food too! Especially doughnuts! Hope you love them! I’m on a hunt for the best donut recipes I can find and this looks like a great one to save. I just bought a new mixer and want to try donuts this weekend. I hope your new mixer is nice! You’re gonna love these doughnuts! I honestly havent tried that and I am so curious of the taste. But I bet this is one at least somehow healthy doughnut. They are so good! Hope you love them as much as we do! Oh, yum! My favorite childhood memories are made of these yummy doughnuts. My Great Grandma would make them homemade, every time we visited her! I have fond memories too of my mom making homemade doughnuts! Thanks for stopping by! I haven’t tried this but it sounds like a delicious meal. I would definitely love to try it out sometime. I’ve been looking for this recipe. Thanks for sharing this looks delicious. Jessica, these doughnuts are ALL about Fall to me! They sound so delicious. Thank you for allowing me to include them in my apple round-up! Have a wonderful day! Thanks so much Michele!! I love all of your recipes too!